Harare, Zimbabwe - A loud and familiar chant rang out across the tightly-packed arena as Emmerson Mnangagwa took to the stage to be sworn in as Zimbabwe's president. "ED Pfee! ED Pfee!" the crowds roared in unison, echoing the ruling ZANU-PF party's election campaign slogan for Mnangagwa to "get in there" in the hope that Zimbabwe's second president will deliver a new era of prosperity and peace. Addressing the thousands of supporters gathered on Sunday at Harare's National Sports Stadium, Mnangagwa urged Zimbabweans to unite across political, tribal and racial divides. "We are all Zimbabweans; what unites us is greater than what could ever divide us," said the 75-year-old, a former vice president and intelligence chief nicknamed "Ngwena", Shona for crocodile. Mnangagwa's inauguration was delayed by two weeks after the main opposition coalition filed a legal challenge to reject the result of the July 30 presidential election, which it said was marred by "mammoth theft and fraud". Electoral officials had declared Mnangagwa the winner with 50.8 percent, ahead of MDC Alliance leader Nelson Chamisa, who got 44.3 percent. But on Friday, Zimbabwe's Constitutional Court unanimously rejected the opposition's bid and upheld the ZANU-PF leader's victory - much to Chamisa's dismay. "President Mnangagwa is disputed as leader," the 40-year-old opposition leader said in a statement. "I have a legitimate claim that I am supposed to be leading the people of Zimbabwe." At the inaugural ceremony attended by other opposition leaders and several regional heads of state, Mnangagwa reached out to the opposition and urged the nation to look forward and work towards helping the country's shuttered economy grow. "The vision of a new and prosperous Zimbabwe, the Zimbabwe we all want is a shared one and transcends political party lines. As a president I pledge to act fairly and impartially, without fear or favour as president of all Zimbabweans," he said. Echoing Mnangagwa's comments, Godfrey Gotora, a 26-year-old who works as a driver in Harare, said he was confident Mnangagwa could transcend the political rift and avoid repeating the mistakes of Robert Mugabe, who led ZANU-PF and the country for 37 years. "Mnangagwa used to work with Mugabe and he could see all the mistakes that Mugabe made," he told Al Jazeera. "ED [Mnangagwa] will correct all those things in the new dispensation. Even those in the opposition who think he will not make a good leader, they will see he has the ability to unite all of us. "Mnangagwa is the father of all of us as people of this land so we must put our trust in him," he said. Ever since it declared independence in 1980, Zimbabwe has been ruled by ZANU-PF. But following the rise of the MDC movement in the 2000s, the country has experienced disputed elections which resulted in violent clashes and court challenges from the opposition. Although Chamisa accuses the judiciary of being under ZANU-PF's control, Mnangagwa has promised a new dawn for Zimbabwe with impartial state institutions. However, since Mugabe's fall in November 2017 in the wake of a military intervention, concerns remain over the power and influence of the country's armed forces. On August 1, security forces crushed opposition protests in Harare, killing at least six people and wounding scores more during demonstrations against delays in the announcement of election results. According to Dewa Mavhinga, the Southern Africa director for Human Rights Watch, the post-election crackdown on the opposition by the security forces "marked a turning point" in Zimbabwe's democracy. "The military is the power behind Mnangagwa's throne, and could be an obstacle to the democratisation project, notwithstanding Mnangagwa's declared desire for a new dispensation," he told Al Jazeera. Mending ties or burning bridges again? Last month's election had been trumpeted as a major step towards mending Zimbabwe's diplomatic relations with Western countries and ending decades of isolation, as well as securing much-needed international funding to revive the economy. Election observers from the European Union and the United States were allowed to monitor a vote in Zimbabwe for the first time in 16 years. In the lead-up to the polls, the opposition had repeatedly complained over access to the voters' roll and demanded more transparency in the printing and storage of ballot papers. After the vote, European Union observers said that Mnangagwa had benefitted from an "un-level playing field" and some voter intimidation, but international monitors largely praised the conduct of the election. But Jeffrey Smith, executive director of Vanguard Africa, told Al Jazeera concerns over the election and subsequent tensions have damaged hopes of restoring ties with the West. "If international donors and world powers were somehow fooled by an orderly election day, and liable to lend support to the government thereafter, those illusions were effectively shattered when the military opened fire on protesters," said Smith. Mnangagwa has expressed regret for the loss of life on August 1 and said he will soon announce an independent commission of inquiry to investigate the violence. The president has repeatedly pledged to lead Zimbabwe to a more democratic era, but Smith told Al Jazeera Mnangagwa's past reputation as Mugabe's right-hand man - accused by critics of being the chief architect behind the political violence during the 2008 elections as ZANU-PF's chief election agent - may stand in the way. Mnangagwa has also faced allegations of playing a role in ethnic massacres that killed at least 20,000 people in the 1980s, when he was a minister of state security. Mnangagwa has denied any role in the killings. The president has repeatedly pledged to lead Zimbabwe to a more democratic era but critics say his brushing off of the past raises doubts over his ability to ensure accountability and justice - especially since much of Mugabe's old guard remains in positions of power. "The Mnangagwa government is nothing new. It [will be] a cabinet stocked with Mugabe-era hardliners, and the absolute worst of the worst who cannily destroyed Zimbabwe over the past four decades," said Smith. But for many Zimbabweans, fatigued after weeks of tensions and uncertainty, the hope is that Mnangagwa's inauguration will allow the country to put political differences behind and focus on fixing the economy, which has seen worsening cash shortages and rising prices of basic commodities. "What we want now is to eat," said Romeo Nemarmbwa, a 34-year-old entrepreneur. "It doesn't matter whether you like the president or not - we want to eat. I am positive that Mnangagwa can do it, he will deliver us from our suffering," he told Al Jazeera. 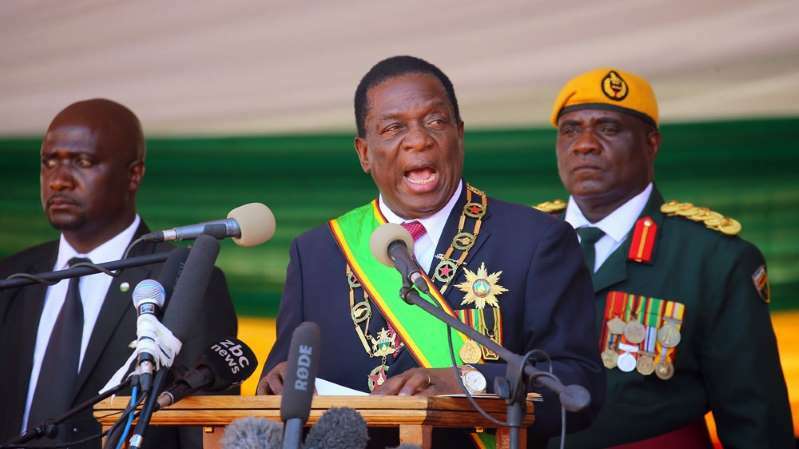 In his inaugural speech, Mnangagwa reiterated his mantra that "Zimbabwe is open for business", pledging to cut down on government expenditure and implement policies to attrack domestic and foreign capital. He also pledged to introduce a raft of fiscal measures to address Zimbabwe's external debt arrears and liquidity crisis. "Through the engagement and re-engagement policy we are opening a new chapter in our relations with the world, underpinned by mutual respect, shared principles and common values," he said. "Measures will be taken to correct the fiscal imbalances that threaten to undermine the viability of the financial sector as reflected through the spiraling cash shortages and the distortions plaguing the foreign currency market," he said. Faced with urgent, complex economic and political problems, over the next five years, Mnangagwa is likely to have a challenging path to navigate in his bid to lead Zimbabwe into a new era. World - U.S. Daily News: A new dawn or more of the same for Zimbabwe?